Jake Olson with USC Coach Pete Carroll and members of the football team. For 12-year-old Jake Olson, football is not a game, it is a passion, whether he's playing center on the seventh- grade Huntington Christian School flag football team, or cheering on his favorite team, the USC Trojans. When Jake was a year old, he was diagnosed with retinoblastoma, a condition in which cancerous tumors develop in the retina, in both eyes. Doctors removed his left eye, but with chemotherapy and radiation, they were able to save his right. That right eye has shown him his world -- the faces of his parents, his twin sister, Emma, the surf near his home in Huntington Beach, Calif., and the fairways and greens of nearby golf courses, where he and his father play as often as they can. The cancer has returned eight times, and each time, Jake beat it. However, this past September, he learned it had come back again, and this time treatment didn't work. Doctors told him they would have to take his right eye, too. It was news that Jake processed quickly. "I said, 'How you doing, buddy?'" said his mother, Cindy Olson. "He goes, 'Yeah, mom this is just going to be a new stage of my life." "I'm just sad I won't be able to see them ever again," Jake said. "It's so hard, and yet cancer wins. But I'm going to experience something no one else can experience." With more than a month before his surgery, Jake told his parents that what he wanted to see most one last time was another USC Trojans game. 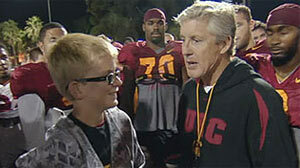 His wish reached Trojan head coach, Pete Carroll. "The first thing was let's make sure that he gets inside and gets to see everything that he wants to see," Carroll said. "God bless him, he deserves every bit of it." The Trojans invited Jake to practice Oct. 14, where he was introduced to his favorite player, center Kris O'Dowd. It wasn't long before a bond was born between the fellow centers. "When I met this kid, I really felt a connection with him because it's just really rare for somebody to reach out to an offensive lineman, someone in our position," O'Dowd said. "He gave us these words of wisdom. It's amazing how a seventh-grader can make 100 guys dead quiet and just hear every word that comes out of his mouth, because they have mutual respect and love for this kid Jake." Within days of their first meeting, Jake seemingly became part of the Trojans team, cheering them on from the sidelines, walking down the hallowed Coliseum steps alongside Coach Carroll, and reveling with the team after they beat Oregon State. "I got to sit next to Pete Carroll on the bus, which was awesome. I got to see them practice, which was awesome," Jake said. "I got to go into the locker room and everyone was partying. It was just awesome." While Jake and his family have been USC fans for years, they never imagined that the team they love so much would come to their aid and take them in as their own during the toughest period the Olsons have ever faced. In just a short time, the Trojans gave Jake a lifetime of memories and a whole new set of images to take with him going into surgery. "I'll know what they look like. …. Blake's [Ayles] long blond hair; Kris [O'Dowd], real big, beard, mustache; my parents; my friends," Jake said. "So when they're talking to me, I'll just picture them in my head -- oh that's my mom, that's my dad. I just want to take as much in as I can." Jake spent the night before surgery rooting on the Trojans at a team practice and getting a last look at his new teammates. Carroll told Jake that the team loved him and made him promise that he would come back after his surgery Nov. 12. "Being at practice with the guys there wasn't this intensity of what we were confronting the next day, said Jake's father, Brian. "It turned out to be this really sweet moment, and I'll never forget that scene and neither will Jake." On the day of surgery, the family sneaked O'Dowd into the hospital as "Uncle Kris." "The nurse came in and gave him his IV and that's when Jake just broke down, just emotionally broke down and his parents broke down. I broke down," O'Dowd said. "I went up and gave him a kiss on the head and just told him, 'You're the strongest kid I've ever known and keep being who you are and everything will work out.'" O'Dowd's words and presence managed to ease some of Jake's pain. "It was a tough morning. My mom woke me up and I started crying and she started crying and it never stopped throughout the morning. But as soon as Kris got there, I felt a little better," Jake said. "I just didn't want that day to come. It wasn't the fear of being blind; it was more like, all right, this is my last minute to see, last hours -- that was the fear." Upon waking from surgery, Jake saw a white light and was comforted when he heard his parents' voices. "When I got home, I really didn't feel sorry," he said. "Now it's already happened and I can move on." Just six days after surgery, Jake was able to fulfill the promise he made to his new teammates and, walking with the aid of a blind stick, re-joined the Trojans at practice. Whenever each player greeted Jake, he said his name. "It's Matt Barkley," the USC quarterback said. "Hey, Barkley how you doing," answered Jake. "It's Joe," said tailback Joe McKnight. "What's up, Joe?" Jake said. And just because Jake couldn't see anymore didn't make the tackles on the field any less vivid. "I mean it's kind of more fun to hear the hits than to actually see the hits," he said. "It's like -- Oh, what just happened?!" And then it was Jake who ended up lifting the Trojans, who had lost to Stanford a few days earlier. Jake told them not to "feel bad." "Guys, you lost, but we'll get them next year and the year after that and year after that all right!" On Saturday before the USC-Arizona game, Jake and his sister, Emma, were on the field for the coin flip and then led the band in the "William Tell Overture" before the fourth quarter. Jake said, "It was awesome."